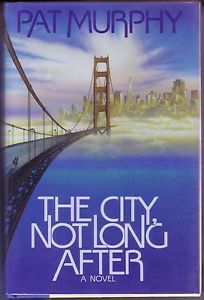 Synopsis: The narrative centres on San Fransisco after a plague. The survivors are all artists or eccentrics and are all peace loving. When a girl comes from outside of the city, warning of war, they realise that they have to defend the city somehow. This is different from other dystopia that I have read, in as much as it doesn’t see the very worst in people. So it may be more apt to call it a utopia. It represents the way that you might hope people would react, the very best that humans can be. Once it occurred to me that this was a utopia, I was able to cope with it a little better. The characters are all a little bit wacky – a group of dreamers and artists who spend their lives creating works of art rather than struggling to survive. Danny Boy begins a project to paint the Golden Gate Bridge blue. The Machine spends his time creating metal insects and creepy crawlies. Books is trying to write a history of post plague San Fransisco. No one struggles for food. Jax is guided to the city by an angel (which may have been made by The Machine) and her mother’s ghost. She brings the news that an army is planning to attack. However, the artists are loathe to take her seriously. And even when they do start to prepare, they vow not to kill but scare the army, unnerve them. Even those who have to be dealt with close up are merely sedated. I understand the points that Murphy is trying to make about warfare and it’s dehumanising effect on the human psyche. She references many historical figures (like Gandhi for example) who used peaceful protest. And the utopian ideas are pertinent. However, I have to admit that I found it a little naive. I couldn’t quite stop my own cynicism from infecting the story. Maybe I’m essentially misanthropic but I find it hard to believe in the best of people. Especially in the area of warfare. At the end of the day, I prefer my post-apocalyptic fiction to be a little harder round the edges. This was too nice by far.